Paul Menard capitalized on crew chief Greg Erwin’s call to stay on the track during the race’s final caution period and came away with a season-best sixth-place finish in Sunday’s Food City 500 at Bristol Motor Speedway. Erwin’s call, which vaulted Menard and his No. 21 Menards/Sylvania Ford Mustang from 13th place to fourth heading into the 14-lap dash to the finish line, was just one of several tactical decisions that kept the No. 21 team in the running for a strong finish in Sunday’s race. Menard started the 500-lapper from ninth place, and the team used a similar stay-on-the-track strategy at the end of Stage One to finish that segment in eighth place, thereby earning three Stage points. The team used the wave-around late in the second stage to regain a lost lap. In the final segment of the race, Erwin again called for the wave-around during a caution period with just over 80 laps left to run. That decision worked out in the Menard/Sylvania team’s favor as well, with another caution flag putting Menard back on the same pit sequence as the race leaders. He was running outside the top 10 when the caution flag flew at Lap 486 of 500 for a spin by Kyle Larson. Erwin’s decision to stay on the track boosted Menard to fourth place for the restart and paved the way for his sixth-place finish, which moved him up two positions in the points standings to 19th place, just four points behind Ricky Stenhouse Jr., who holds the 16th and final spot in the Playoff standings. Menard said it was a great Bristol weekend all around, other than a minor mistake he made on a pit stop. Menard also praised Erwin’s decision to not pit in the closing laps. “Greg made a good call to stay out and we came home with a top 10,” he said. Menard said the race was a good one from his perspective, thanks in large part to the preparation of the racing surface. Eddie Wood said Menard, Erwin and the pit crew had their best days of the young season. “Paul did some great driving, especially on old tires,” he said. “The pit crew never made a mistake, and Greg made great calls all day. 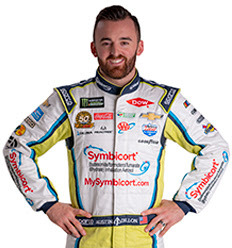 Menard and the No. 21 team return to the track next Saturday night at Richmond Raceway. ● Clint Bowyer started seventh and finished second. ● Bowyer jumped to fifth in the opening laps before the race’s first caution on lap six. He moved to second on lap 10. ● Bowyer led laps 39 and 40 when leader Chase Elliott spun. A caution brought the field to pit lane and he restarted second. ● Despite a tight-handling car, Bowyer took over the lead with just seven laps remaining in the stage, leading laps 118 to 123. ● A caution saw all but Bowyer and two others visit pit lane. ● Bowyer restarted first for the final two laps, but Ty Dillon edged him by a few feet for the stage victory. ● Bowyer started 15th and finished eighth. ● Bowyer started back in the field because he elected to pit during the stage break and not in the final laps of Stage 1 like most of the field. ● Bowyer turned some of the quickest laps on track and climbed back into the top-five by lap 213. ● Bowyer appeared ready to climb even higher, but he was blocked on a restart by another car and reported his car wouldn’t turn. ● Bowyer held on to finish eighth. ● Bowyer started seventh and finished seventh. ● Bowyer climbed to fourth by lap 275, third by lap 285 and second by lap 355, then took the lead on lap 375. ● After a round of pit stops Bowyer found himself in third closing in on the leaders. ● Bowyer’s bid for victory ended when he and Joey Logano made contact as they battled for second with about 60 laps remaining. ● The cut tire sent the No. 14 into the wall then to pit road for repairs. ● Bowyer remained on the lead lap but dropped to 15th and struggled because of the damage. ● He held his position until a caution with 15 to go saw the No. 14 stay on the track while the leaders pitted. ● Bowyer restarted in sixth and climbed to fourth before the cars with fresher tires dropped him to seventh in the final laps. ● Bowyer earned his fourth top-10 of the season and his 14th top-10 in 27 career Monster Energy NASCAR Cup Series starts at Bristol. ● This was Bowyer’s third straight top-10 and his third consecutive top-10 at Bristol. He has finished in the top-10 all but once at Bristol since joining SHR in 2017. ● This was Bowyer’s 200th career top-10 in 477 career Monster Energy NASCAR Cup Series starts. ● Bowyer finished second in Stage 1 to earn nine bonus points and eighth in Stage 2 to earn an additional two bonus points. ● Bowyer led five times for 24 laps to increase his laps-led total at Bristol to 281. “We had a good car, it’s just horribly disappointing. You get that close. Long runs were my strong suit. I couldn’t take off all day long. Some of those things made sense. We were down a little bit on air and it took a little bit of time for them to come in. The problem is when you balance around that and you just pump the air-pressure up, then it doesn’t work either and you don’t handle there. It’s just disappointing. ● Kyle Busch started 17th and finished sixth. ● Busch started 17th but found trouble just two laps into the 500-lap race. With the cars of William Byron and Aric Almirola making contact ahead of him, Busch slowed to avoid contact but was hit from behind by the car of Ricky Stenhouse Jr.
● Despite the damage, the Skittles team did not panic in the least bit. Busch came to pit road for multiple stops over the course of the first 40 laps of the race, getting the damaged fixed quickly and staying on the lead lap. ● The 2015 NASCAR Cup Series champion restarted 23rd on lap 45 and immediately started moving up, running 14th by lap 70 and all the way up to eighth by lap 111. ● The caution waved with less than 10 laps to go in the stage, so crew chief Adam Stevens called Busch to pit road for four tires and adjustments on lap 119. Busch restarted 10th and vaulted all the way up to sixth in short order. ● Buschstarted fourth and finished fifth. ● With a few cars pitting during the caution for the stage break, Busch restarted in fourth on lap 135. ● The Skittles driver held his spot within the top-five for most of the second stage, but he battled a handling condition that he described to Stevens and the team as a lack of overall grip, saying the car felt like it was on top of the track too much. ● The Las Vegas native used an abundance of patience, staying out of trouble and finishing Stage 2 in the fifth position. ● Started third and finished first. ● Busch came to pit road on lap 254 to take on four tires and adjustments, setting him up to restart in third for the start of the second half of the race. ● Busch struggled to get up to speed on the front end of the run on tires, but he gained steam as the tires wore down, moving from sixth on lap 331 up to fourth by lap 375. ● An opportune caution on lap 375 sent Busch to pit road to the attention of the crew, where his Skittles Camry got four tires and adjustments. Quick work by the over-the-wall crew vaulted Busch to second on the ensuing restart. ● Busch used the track position on the restart and powered his way around Clint Bowyer on lap 383 to lead the race for the first time. ● Busch held his first lead for 25 laps before Bowyer got by him on lap 400, and Joey Logano passed him for second on lap 413. ● Ten laps later, quick work once again by the Skittles Toyota crew during a round of pit stops under caution sent Busch back on track in the lead, which he held for 27 laps. ● The call of the race came during the final caution of the race, 20 laps from the scheduled finish, when Busch stayed on track while the lead-lap cars ahead of him all pitted. ● He got off to a solid restart with 14 laps remaining and was able to hold off the field the rest of the way, crossing the finish line .722 of a second ahead of his older brother, Kurt Busch, the runner-up. ● Kyle Busch’s victory was his 54th in 506 career Cup Series races and his eighth at Bristol. ● It was his third victory and eighth top-10 finish in eight races this season. ● Busch led three times for 71 laps, giving him 498 laps led this season and 2,294 laps led in 28 career races at Bristol. “It’s pretty awesome to be able to snooker those guys, get our win today here at Bristol. I’ve seen that game played on both sides. I’ve seen it work more times than not. When the guys stay out, you have a better opportunity to be able to go for the win. It kind of fell into our hands there, being able to lead the restart, being able to get Kurt to not spin his tires and get up to second – it’s a good run for us Busch brothers to come home 1-2. Love this place. It was fun to battle with the brother there at the end. I know we didn’t quite get side by side, racing it out. I saw him working the top. I’m like, ‘I better go.’ I got up there, was able to make some ground. I don’t know, we’re crazy. We just do what we do, try to win. Man, just awesome to be here in front of this crowd, here at Bristol Motor Speedway. The Skittles Camry wasn’t the best today, but we made the most of not having the best and got everything we needed here at the end. I felt like we had to overcome a lot, especially on the short runs. We just didn’t have the burst-off speed that we needed for the first 30 to 40 laps. It kind of seemed after that we could maintain with a bunch of those guys and then we could kind of run those guys back down just a little bit. It was hit or miss a little for us today and this weekend. We thought we had a pretty good car in second practice yesterday and going into the race. We just didn’t quite have the speed. We just didn’t show exactly what we needed there. Next Up: The next event on the Monster Energy NASCAR Cup Series schedule is the Toyota Owners 400 on Saturday, April 13 at Richmond (Va.) Raceway. The race starts at 7:30 p.m. EDT with live coverage provided by FOX. Kevin Harvick finished 13th in Sunday’s Food City 500 at Bristol and on the lead lap and that’s about an amazing of a comeback as you’re likely to see at Bristol Motor Speedway. Making up a lap or perhaps two is difficult. Harvick, at one point, was scored four laps in arrears. Thanks to an incredibly fast No. 4 Ford Mustang, the 2014 Monster Energy NASCAR Cup Series champion was able to race his way back onto the lead lap and into the picture. The day certainly didn’t start out well – the team failed pre-race inspection three times and was penalized before the race had even begun. Because of the inspection issues, Harvick dropped from 13th to the rear of the field at the start of the race; one crew member was ejected, the driver had to do a pass through penalty under green once the race began and the team will lose 30 minutes of practice time at the next points event. His first break came when he hit pit road after the green flag – a multi-car incident brought out the caution flag and Harvick only lost one lap in the pits. But a loose wheel put his No. 4 back on pit road a short time later and Harvick soon found himself multiple laps down. He joined the lead-lap cars during the final caution of the race when he was in the free pass position. The finish was his worst since a 26th place run at Daytona this year. But it may have been one of the team’s most impressive efforts overall. It was a frustrating day for pole winner Chase Elliott as the Hendrick Motorsports driver lost the power steering in his No. 9 Chevrolet barely 20 laps into the race, then was involved in an incident just shy of the halfway point of the 500-lap race. Despite the setbacks, he was still contending for a spot in the top 10 when his car hit the wall with less than 70 laps remaining. He led the first 38 laps of the race, finished 11th and on the lead lap, but saw a good day otherwise ruined. “Definitely not what we started out hoping for,” he admitted. “We got turned late in the race, that was about it. We fell behind from there. Denny Hamlin, the series’ most recent winner heading into the Bristol race weekend, appeared to have made the move of the race when a two-tire call under caution at lap 417 put him out front for the subsequent restart. The lead was short-lived. Hamlin was penalized for speeding on pit road, something that’s been the Joe Gibbs Racing driver’s Achilles heel, and forced to give up the valuable track position. He did manage to rally and finish fifth, however. “I screwed up our strategy on pit lane,” Hamlin admitted. “We’ll get it cleaned up. Just got to work through all the kinks and clean stuff up. Hamlin won the season-opening Daytona 500 as well as last weekend’s O’Reilly Auto Parts 500 at Texas Motor Speedway. The TMS win came after he rallied from a, you guessed it, pit road speeding penalty. Clint Bowyer led five times for 24 laps and had one of the best long-run cars in the field Sunday. But contact with Joey Logano on lap 432 resulted in a flat tire for the Stewart-Haas driver and put the team in catch-up mode for the remainder of the race. Bowyer managed a seventh-place finish in spite of the setback. The cars of Team Penske teammates Logano, Brad Keselowski and Ryan Blaney were among the best for much of the Food City 500 and two of the three – Logano and Blaney – finished third and fourth respectively. Combined, the trio led 344 of the race’s 500 laps. Keselowski appeared to be in line for a shot at the win as well, but confusion when the field was reset for the final restart left the former series champion mired in a three-wide situation coming to the green. He was eventually issued a pass-through penalty and finished 18th. "What a battle at the last great coliseum today. Our SYMBICORT® (budesonide/formoterol fumarate dihydrate) Chevrolet Camaro ZL1 was pretty good throughout Friday and Saturday, but we knew we needed just a little bit more in order to have a shot on Sunday. My crew chief, Danny Stockman, and the No. 3 team made a few setup changes for the race that didn't work in our favor, unfortunately. Sometimes you have to take a gamble, and it just didn't pan out in this case. Even though we didn't have the best-handling car, we were able to maintain and stay on the lead lap. It was a war of attrition, really, just staying up there. At one point in time we got the car decent, even though it was really tight. Towards the end of the race I hit the wall because we got the rear too free. It damaged our car a little bit. We tried to get some track position back, but it didn't work out. All-in-all, for what we had, I'll take a 14th-place finish." 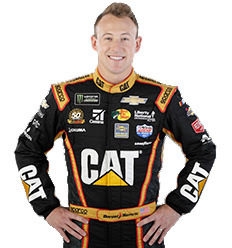 Daniel Hemric, driver of the Richard Childress Racing No. 8 Chevrolet in the Monster Energy NASCAR Cup Series, has a different sports heritage. And it’s a fitting one to note this weekend as the NCAA Men’s Basketball Final Four gets under way in Minneapolis, Minnesota. Hemric, 28, will start 26th in Sunday’s Food City 500 here at Bristol Motor Speedway. Race fans might not recognize the name Dickie Hemric. He never won the Southern 500 or the Daytona 500 or any other legendary NASCAR event. But Dickie Hemric etched his name in the record books of both the NCAA as well as the NBA. Dickie Hemric held the Atlantic Coast Conference (ACC) scoring record for 50 years, totaling 2,587 points as a Wake Forest Demon Deacon. He was named player of the year during the first two seasons of the ACC’s existence (1954-55). The mark stood until 2006 when it was finally broken by J.J. Reddick of Duke University. His 1,802 career rebounds still stands as a conference record. A third-team All-American as a junior and a second-team All-American selection as a senior, Hemric was a member of the Boston Celtics’ first championship-winning team in 1956-57. Daniel Hemric had no idea of his relative’s exploits on the court until taking in a college game with current RCR teammate Austin Dillon and younger brother Ty Dillon. “I found out about it, believe it or not, this goes way back,” Hemric recalled. “Almost 13 years ago. I went to my first college basketball game and I went with Austin and Ty. We went to see North Carolina and Wake Forest. We get there inside the arena and I see Hemric hanging from the rafters, the jersey. I had no idea. Racing won out over other endeavors when he suffered a knee injury as a teenager. Rookie of the Year contender Ryan Preece is a former Bristol winner in both the Whelen Modified Tour and Xfinity Series. Sunday will be his first start at the 0.533-mile oval in the Cup Series. “I think all short tracks should be good tracks for me, but this is a team sport,” Preece said. “But we’ve got some work to do on our car to make it better and I think we’ll be alright. Can past success in those series translate? “I think it’s all relative; a race car is a race car,” he said. “They need to be able to get into the corner, you need to be able to turn the center and you need to be able to put the gas pedal down as quick as possible. Team Penske driver Ryan Blaney didn’t get the pole, but the 24-year-old did establish a track qualifying record with his run in the second round Friday at BMS as the field was set for Sunday’s Food City 500. Blaney’s speed of 132.076 mph (14.528 sec.) in the No. 12 Ford eclipsed the previous mark of 131.407 mph set by Denny Hamlin in 2015. He becomes the 14th driver to hold a current track qualifying mark. Kurt Busch holds the record at more tracks than any active driver – Charlotte (both Roval and 1.5-mile layout), Las Vegas and Texas Motor Speedways. Seven races into his first season at Roush Fenway Racing and veteran driver Ryan Newman sits 20th in points. He is coming off his best finish of the season, an 11th-place run last weekend at Texas, since taking over the driving duties of the No. 6 Ford Mustang. “I’ve spent four times as much time at the shop per week (this year) than I did in the last five years,” Newman said. “I think we have some really great meetings when we have our sit-downs, and layers of meetings – not just a meeting but layers of meetings that make us perform better and learn where we’re at. Monster Energy NASCAR Cup Series drivers Erik Jones and Joey Logano led Saturday’s two practice sessions for the series, posting times of 14.771 and 14.894 seconds, respectively … Pole winner Chase Elliott clocked in 16th quickest in the final session while defending race winner Kyle Busch was fifth overall.